The Canada–Germany game’s audience. Photo by Brad Jorgensen. 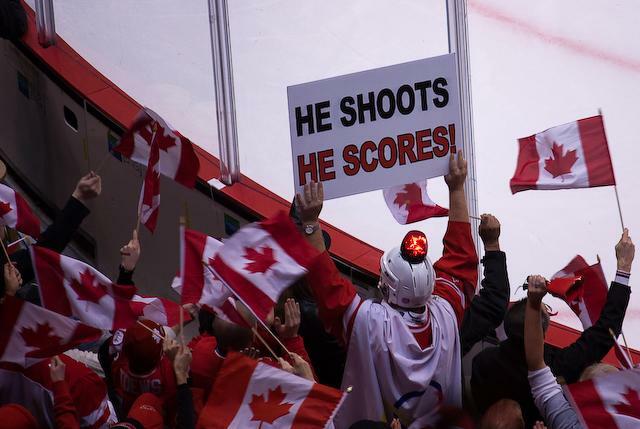 Canadian hearts are beating once again after the men’s hockey team (barely) defeated Slovakia 3–2 to clinch a berth in Sunday’s gold medal game. Their opponents: a young, exciting Team U.S.A. that rode goaltender Ryan Miller to a 5–3 win over Canada in the tournament’s preliminary round. It’s safe to assume Sunday’s game will be one of the biggest television event in our nation’s history—and as Leaf fans, we get to hedge our bets! The Americans have three solid Maple Leaf connections: Phil Kessel on the ice (Mike Komisarek was supposed to be there, too, before a shoulder injury ended his season), Ron Wilson behind the bench, and Brian Burke, the architect, up in the press box. Burke and his late son, Brendan, were the subjects of a beautiful Michael Farber piece for Sports Illustrated earlier this week, and the current Leafs/former Canucks general manager has been getting warm ovations in Vancouver since the Olympics began. Of course, we don’t want the Americans to win or anything. It’s just nice to know there’d be a small, Toronto-centric silver lining should the unthinkable occur Sunday afternoon.